Say what you like, but Hajime Isayama’s Attack on Titan stirs a lot of emotion in people. Sometimes it’s love for the giant-killing action and cool aesthetic. Other times it’s frustration for the uneven pacing. And, for another group of people, it’s bewilderment. I currently fall into the third category. On a superficial level, I accept that Attack on Titan is one of those ubiquitous series that defines a cohort of manga and anime fans the way Naruto and Evangelion did. But on a personal level, I prefer approaching Isayama’s work from the cultural and sociological side. What external forces inform his work? We can argue whether Attack on Titan pushes pro-military sentiments, whether Isayama is a World War II apologist, and whether the manga demonstrates the disaffected ennui of Japan’s younger generations. Right now, however, as the manga supposedly sets the stage for the final 20% of its story, I must ask a simple question: what is Isayama doing? It would be a lie to say I haven’t had reservations for a while. Pushing aside the nationalistic implications, Attack on Titan’s plotting has always been questionable. Sure, let’s introduce the concept of a hidden royal family that controls the walled city from the shadows. Okay, let’s put forth the idea that there’s a widespread conspiracy and the true monarch has mind control powers. Right, it makes complete sense that the military will launch an insurrection, overthrow the current power system, and elevate one of their own as the new queen. Wasn’t this supposed to be a post-apocalyptic adventure about discovering what’s outside the walls? Why are we so focused on what’s happening inside them? Especially if nothing portrayed has anything to do with what’s in Eren’s family basement? I followed these twists and turns with growing skepticism, but I did keep following them. I really wanted to know what was in the basement, you see. Without a doubt, many other readers felt the same way. Isayama finally answered the basement question in recent chapters– and my bewilderment levels have increased rather than decreased. Now, I read Attack on Titan not for seeing how external factors influence Isayama’s work but rather as a hapless spectator who cannot turn away from an impending car crash. The basement contained three diaries left behind by Eren’s father, Grisha Yeager. In them, we learn the truth of the world. Namely, we discover that the walled city is not the last bastion of humanity. The nature of the reveal isn’t especially original. Isolated pockets of humanity make up the backbone of many young adult dystopias. Another well-known shonen manga, Claymore, incorporated the concept into its worldbuilding, albeit in a different way. But what do you do when the very foundation of a manga’s premise is undermined like this? The idea behind Attack on Titan’s Survey Corps is to explore the world beyond the walls and to find a way to free humans from their wall-enclosed life. The exploratory nature of their core duty is part of the manga’s appeal in early volumes. To discover that there are more humans, that the walled city exists on a small island, that an enemy more dangerous than the titans themselves lives across the sea is mind-boggling. Why introduce such game-changing elements so late in the series? Some aspects of the reveal are needed to explain previous mysteries. The people of the walled city are descendants of a race of humans that when exposed to the right stimulus – such as an injected serum – can turn into titans. These are regular mindless titans. But what about titan shifters like Eren and Annie? Why do they retain their human intelligence? The explanation lies with the creation myth. The founder of this race of people was a woman named Ymir Fritz. The exact details vary but long story short: she gained the power to transform into a titan. With this ability, she elevated humanity and created an empire. After her death, through means currently unspecified, her titan ability was split into nine parts – giving rise to nine titan shifters with unique abilities. This is all well and good, but this explanation ushers in some ramifications. Unfortunate ramifications. Like what has happened in many real world examples, Ymir’s empire fell into disarray and was overthrown. The people it oppressed rose up and established their own empire. The oppressed then proceeded to become the oppressor and the survivors of Ymir’s empire – save for those who fled across the sea to what would eventually become the walled city – suffered under the new regime’s rule. For the so-called crime of bearing Ymir’s blood – that is to say the genetic potential to turn into titans – these survivors and their descendants were treated like monsters. They were sequestered to specific occupation zones. Daring to leave those district limits resulted in horrific consequences. In addition, to identify their status as one of these pariahs, they had to wear identifying armbands. I don’t know about you but this sounds eerily familiar, doesn’t it? Look, as a longtime manga reader and anime watcher, I’m well-versed in Japan’s pop culture love affair with World War II and Nazi Germany. But combined with the pro-military implications of Attack on Titan, introducing this kind of subjugation and dehumanization raises some serious questions. Where do we draw the line? 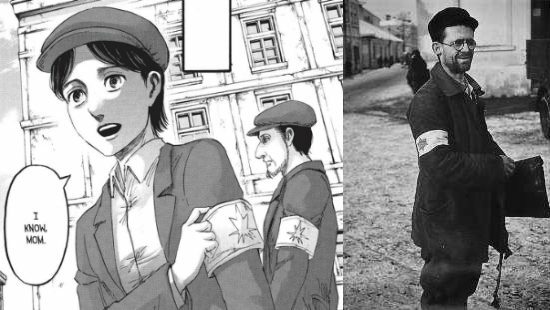 Digging deeper, the parallels between real life Jewish people and Attack on Titan‘s Eldians — as the race of potential titans are called — point toward some regrettable implications. The Eldians enjoyed a tyrannical rule? They can turn into literal monsters? What is Isayama trying to say here? It would not be much of a stretch to argue that we’re seeing apologia in action, that the Eldians deserve this treatment. If I’m feeling charitable, I could argue that Isayama is trying to portray all sides — the the Eldian descendants exiled on the island walled city, the Eldians living in squalor, and the Marley Empire that now oppresses the Eldians — in both a positive and negative light, but everything I’ve read prior to this plot development suggests that he is not nearly strong enough a writer to pull this off successfully. Speaking of dehumanization, one of the punishments dealt to these descendants who violate the law – or just piss off the wrong officer – is turning them into mindless titans and unleashing them upon the people who live in the walled city. It’s meant to be a great irony, you see. Eating their own people? How clever! How funny! Given everything that happened prior to this revelation, I can accept and go along with the idea. What I didn’t sign up for was the soap opera that accompanied it. In Grisha’s journals, we learn he comes from the empire across the sea. That he was one of the subjugated people. That he once had a wife and son there. But when he joined an underground rebellion to help his people, it came crashing down around him and he eventually ended up on the island across the sea. Through a strange twist of fate, he managed to escape the fate of a mindless titan. His wife, however, did not. Why bring this up? Grisha had a first wife that was turned into a mindless titan. When he entered the walled city, he married Karla, the woman who would become Eren’s mother. Remember the beginning of Attack on Titan? When Eren and Mikasa saw his mother get killed by a titan? Guess who that was? Yes, Grisha’s first wife killed and ate his second wife, only to later be killed by the son of that union. Look, I like a little melodrama in my manga. It’s one of my favorite things. But at some point, restraint is important. Adding too much becomes absurd. Attack on Titan has become ridiculous. The sentiment is only further compounded by Isayama’s most recent narrative choices. Not only has he opted to use a timeskip to jump a few years into the future, he has shifted focus from the characters we’ve grown to know and love over almost 100 chapters to the empire across the sea. We are dropped mid-action into a world-encompassing war against the Middle Eastern Empire — as if we didn’t already have enough squirm-inducing real world parallels — and meet the next generation of warriors who want to become titan-shifters. I can understand the choice on a certain level. You can argue that Attack on Titan was at its most interesting when it had the trappings of a training school. Some of the most gripping scenes arose when wet-behind-their-ears cadets were thrown into action too early. I can see some similarities in these scenes where titan shifter hopefuls try to prove their worth. But I have one pressing question about all of this: why should I care? This late in the game, with supposedly only 20% of the story left to go, why should I care about these kids? I want stone cold killer Levi. I want maniacal genius Hange. I want the does-whatever-it-takes-to-protect-her-own Mikasa. I even want Eren, and he’s my least favorite of the surviving characters! Suffice it to say, I feel a lot of trepidation. How is Isayama going to wrap everything up? Can he do so satisfactorily? I certainly don’t know. But having invested this much time and energy into the series, I can only follow it to the bitter end and hope it isn’t too ridiculous. But I suspect my hopes are in vain.